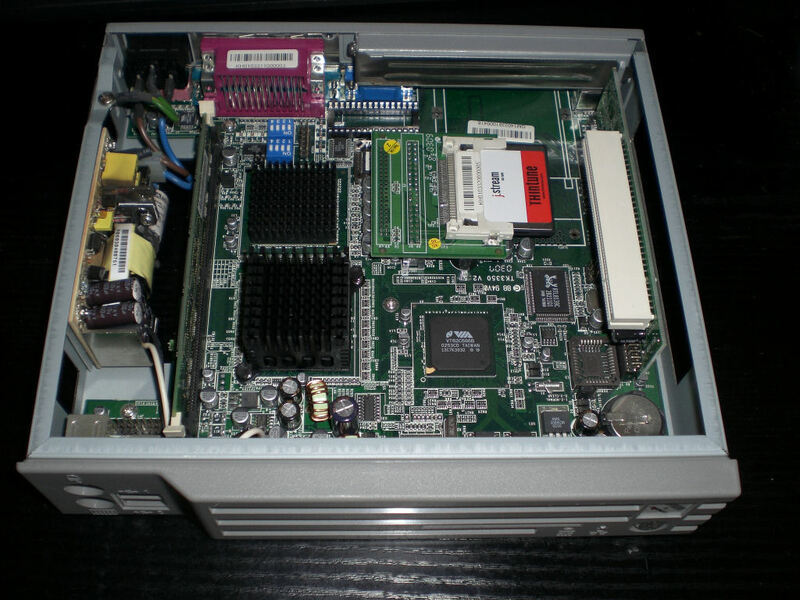 Orginally, i used a regular PC for FLI4L (details about this PC see here). Between october 2006 and august 2007 a used “Lica” thin client with a Geode CPU was used, which worked fine – until the power supply failed. As a replacement i bought again a used thin client, this time an even smaller and more economical model “Thintune M”, based on a VIA C3 and a mainboard, which only needs a single voltage as power supply, so one can use a simple wall power supply in case the internal power supply fails. Unfortunately, the the originally used ISDN/DSL-card was not useable any more – the ISDN part was fine, but the DSL connection could not be established. 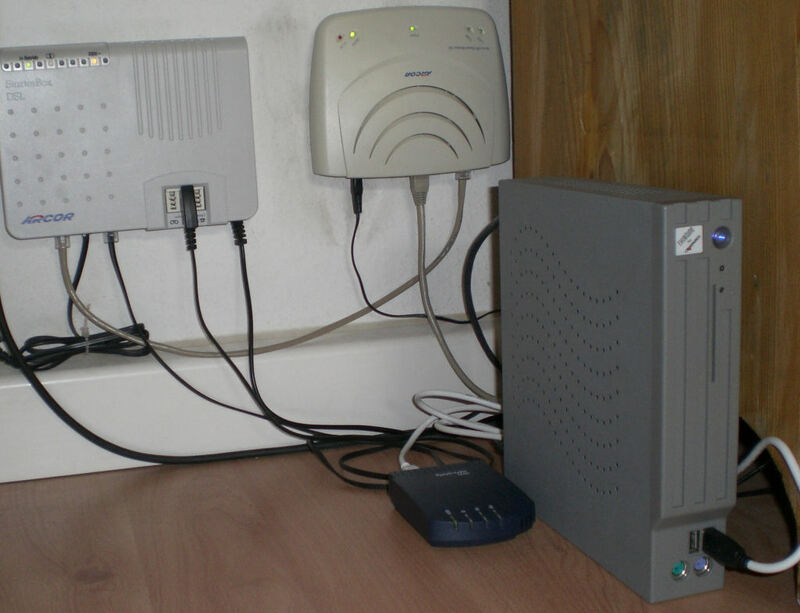 Therefore, the old, external DSL modem is in use again – which makes sense anyway for future upgrades of the DSL bandwith of more than 6 MBit. For the ISDN connection a Fritz!Card USB is used, which doesn’t need a separate power supply and works fine with FLI4L. As i got some queries about this: I don’t have any technical documentation and i don’t know anything about the exact pinout for the connector, where you put in the PCI riser card. I also don’t know, where you can buy such riser cards or if you have to use any additional circuits on the motherboard, when adding a riser card. Before you buy such a device, you should ask the seller, if it is equipped with the riser card – thank you! The CPU produces only little heat and therefore only needs a passive cooling – particularly as the case provides a number of ventilation holes to avoid heat accumulation. In the original condition, there where 64 MB memory installed, which is generally enough for FLI4L. But the system uses a RAM disc, which is also used to hold the extracted OPT archive, so there is only little space left for temporary files, which also will be written to the RAM disc. With 256 MB there is enough room. 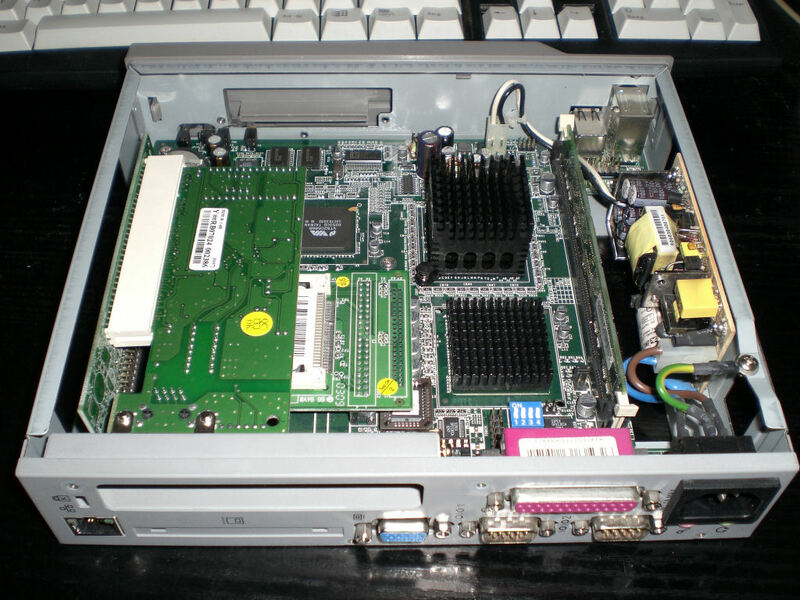 Also a CF-IDE adapter was provided, which doesn’t need a separate power supply and will be plugged in directly to the IDE connector on the mainboard, so there are no loose parts inside the case. One can also see some cavities for an optional PCMCIA slot and a chip card reader, which where not populated. It should also be possible to use the USB ports internally, since there are multi-pin connectors just behind the front plugs. The usual procedure for installing FLI4L on a CF card is the direct installation on the only existing FAT partition of the CF card. For using VBox an ext3 partition is neccessary, if one does not want to run VBox completely in a RAM disc. Therefore i installed the CF card in a different way: First i prepared a regular hardddisc with a minimal setup. This harddisc was then used as a boot drive together with the CF card connected as the second drive in the system (the CF card adapter had a jumper to set it as “slave”). Now the “real” installation to the CF card could be done, whereas the the file /boot/hd.cfg was changed manually, since the harddisc should not be used as /dev/hdb but as /dev/hda. An other way is partitioning the CF card in a IDE-CF adapter with a regular Linux and using the “direct HD-Install” option of FLI4L, since a card reader only shows the first FAT partition. Tool files are still written to the RAM disc. To avoid the disc being filled completely and to keep the files when restarting the router, OPT_CPMVRMLOG is used – this only occurs once a day, so the CF card is not used very often, even in continous operation.